Live to Love, Love to Live: Dag man I could not defeat the "DagWood"
So, this past Monday the 18th, I experienced the "DagWood". 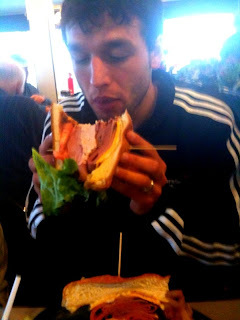 It is a very large sandwich known to Columbus, Ohio natives as a monster of a deli sandwich. The Ohio Deli and Restaurant was on Man vs. Food this past year on the Travel Channel. What this guy does on this show is to try and defeat food challenges that 99.9% of people cannot defeat. Well, I got a little ambitious and tried to take it on. I mean come on, this thing is so big. But, the kicker is not eating the sandwich. In order to win this challenge you have to eat all the french fries on your plate also. 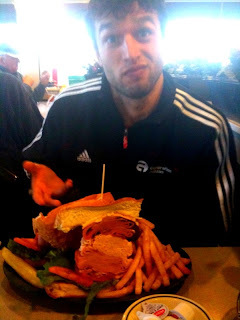 Now I think i could have forced that ginormous sandwich down,but to put all those fried fench fries in my stomach would have put me in line with meeting an old friend named 'Ralph", multiple times. So, getting to how far I got, haha, I feel like such a sally. But, I only ate half the sandwich and about 10 fries. Once I realized I could not do it after half, I did not want to put myself through the pain in trying. I mean look at the picture what would you do? If you think you could do it, tell me why and what evidence you have that warrants such a case, comment below.